What is Susan really up to? That was one of the more pressing questions Arrow Season 5 Episode 12 as she continued her quest to dig deep into her lover's past. 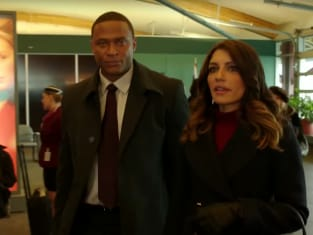 There's always been something sketchy with Carly Pope's alter ego and I'm now getting the feeling that she's going to be worse than I first imagined. Ever since the days of her trashing him in the media, it was clear she was harboring an ulterior motive. She's probably looking for that story to define her career and it's pretty sad. I guess it shows just how relentless she is to find out the truth. It will be terrible when Oliver finds out what she's up to. It will likely result in him not trusting anyone outside his circle ever again. I've never really been a fan of Susan's relationship with Oliver because there's always been something I did not like about her. Poor Oliver probably looked at her as an escape from all of the drama in his life. Little did he know that his girlfriend has been conspiring against him all along. Walker running off to Bratva was hardly a shock. There needed to be some way to bring Anatoly into the present, but linking it all up with the Walker drama was a bit of a stretch. Maybe it was thrown together to make us feel like the flashbacks were more worthwhile this time. We already know they're worthwhile. 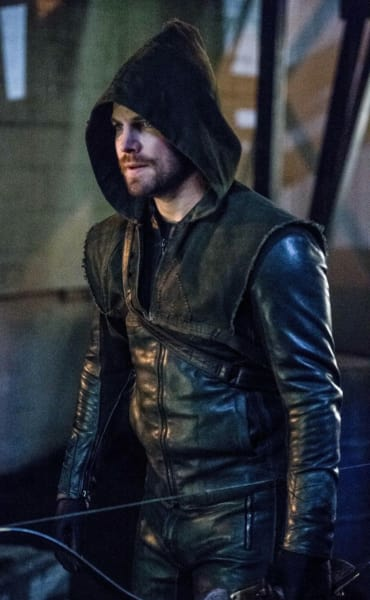 Getting to witness Oliver becoming the Arrow on Arrow Season 5 Episode 11 sort of made up for most of the Arrow Season 4's flashbacks. God, they were awful. Was there anything good about that whole season?! Diggle back in the field was a delight. He was MIA for so long due to that arrest Prometheus orchestrated. But he's back and better than ever. Lashing out at Walker's henchmen was the best foot forward for him. He knew getting rid of Walker would be the key to bringing some harmony back into his life with Lyla. Additionally, he was well aware of the lengths Walker would go to in order to take him down. Resisting the urge to decorate Walker's face with bullets showed us that Diggle was thinking of the bigger picture. Somehow, he would have wound up back in jail. On top of that, he would probably be ruled a worse person than Oliver. 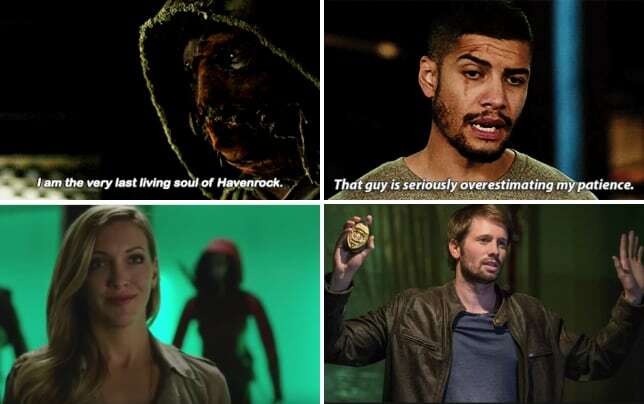 Yes, the notion that Oliver has to be the worst person on his team for them all to function as a unit was bizarre. They have each done some questionable things over the years. The new additions like Rory, Curtis and Rene are blissfully unaware of some of those things. Rory's sacrifice proved just how integral he is to the team. There was a possibility the nuke could have blasted him back to Havenrock. Thankfully, he was fine. Losing the rags would mean he could not be able to go by the name of Ragman any longer, so there's that. His disappearing act will likely result in him returning to help the team when they really need it. You could tell Felicity was sad to see him depart, but she was kind of too busy wondering about what she could do next with Pandora. Her friendship with Helix helped her a lot this week. This storyline is definitely going to make Felicity rely way too much on the power of Pandora and it will come back to haunt her when Helix shows up, looking for her to do something for them in return. Quentin's return seemed rather out of the blue, but at least we got confirmation that Paul Blackthorne was still part of the cast. Lance was trying to do too much. The interview was a bit much when you consider the fact that he had just left rehab. It was a stress that should not have been sent his way. It was a nice touch to have Rene stay behind to make sure everything went smoothly with his interview. Bringing up Laurel was definitely warranted. Rene was only trying to make sure Quentin did not drop the ball during the interview. Obviously, Quentin was going to get pissed about the whole thing, but it was obvious he would warm to Rene by the end of the hour. However, Rene's story about Lance making him a better person all those years ago seemed like a tired old cliché. 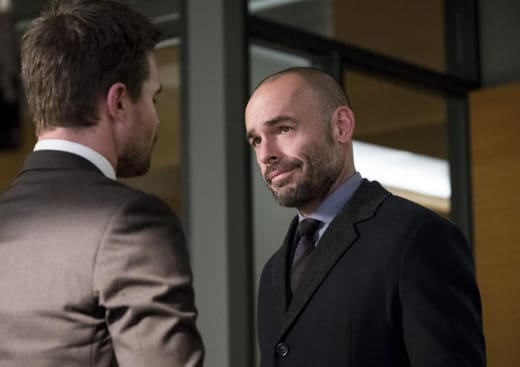 Arrow Midseason Report Card Best Twist, Worst Relationship & More! It would have had more emotional impact if Rene revealed it when he first joined the team. It just seemed too convenient for Rene to reveal it during the scene with the pair making amends. "Bratva" continued to push narrative along at a brisk pace, but it would be better to have some more episodes about Prometheus. Yes, he's the big villain this time around, but his episodes have been the bright spots of Arrow Season 5. Rory telling Oliver about Felicity's deception was brutally honest. It proved he did not want any secrets among the team. Felicity taking Curtis and Rory with her to gain access to the phone network felt like a really bad sketch. It just fell flat. Maybe it's because we know these characters would never act in that manner. Dinah comforting Oliver was surprising, but it showed us at home that she's not as hard up as she would like everyone else to believe. Did anyone else think this would have been the episode for Talia al Ghul to show up in the present? Can Thea please make her way back to Star City to take down Susan? Remember you can watch Arrow online right here on TV Fanatic. 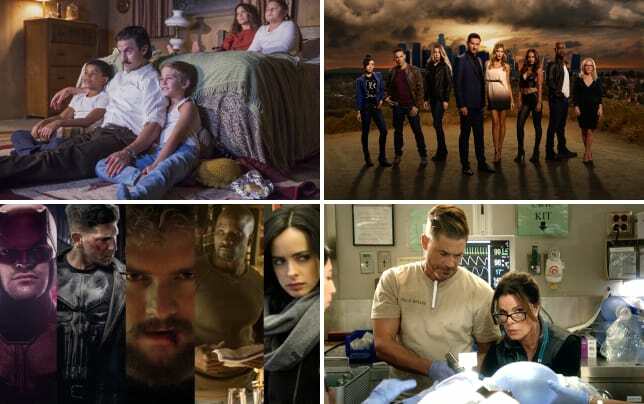 Get caught up now! Note: Arrow Season 5 Episode 13 airs February 15 on The CW. 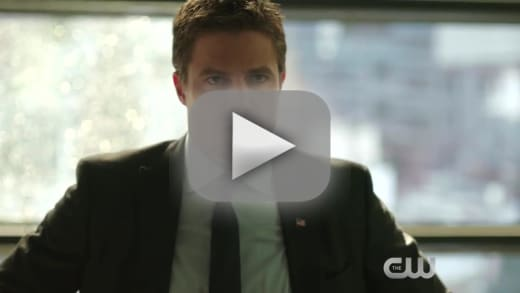 Arrow Promo: Who Failed Star City? Diggle: Are you ready for this? Dinah: When I signed on I didn't think I would be stopping a nuclear arms deal in a foreign country. Diggle: When I signed on I didn't think I'd be dealing with aliens. Arrow Round Table: Did Felicity Go Too Far?